This large-scale educational project ran throughout 2016, and reached its climax on October 21st and 22nd at the Jersey Opera House. 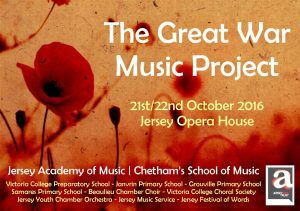 The Jersey Academy of Music’s ‘Great War Music Project’ brought together hundreds of children and young musicians and involved many of the island’s schools, operating in partnership with Chetham’s School of Music, Manchester (one of the UK’s leading specialist under-18 music schools), and sponsored by the Jersey Arts Trust. In February this year, primary school children in Jersey and Manchester were invited to write a poem based on ‘Life in the Trenches’, and over six hundred entries were shortlisted to just twenty from each location. The Jersey entries were adjudicated by Paul Bisson from Jersey Festival of Words. These shortlisted poems were sent to leading UK composer Laura Rossi, who had the task of whittling this down to just six poems in total, three from each location. 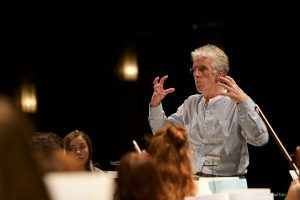 In early Summer, maestro Rossi set to work composing a new piece for childrens choir and chamber orchestra, and this was completed in July. Four local schools joined forces to perform this new work, entitled ‘Remember Them’. 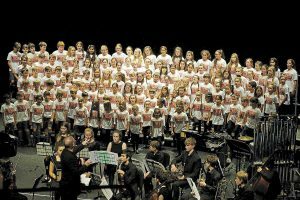 Children from Victoria College Preparatory School, Grouville School, Janvrin School, and Samares School, formed a large chorus, and rehearsed all term. 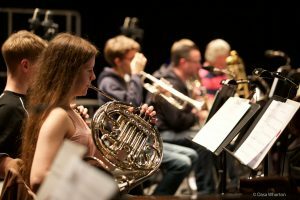 This work received its public premiere on Saturday 22nd October at 11am at the Jersey Opera House, conducted by eminent UK conductor David Lawrence. The work was also performed at a schools concert given to a capacity audience of 550 primary school children on Friday 21st October at 1.30pm. In addition to this, the forty shortlisted poems from Jersey and Manchester have been collated into a book. 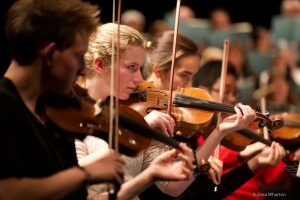 The second element to the project was built around the Jersey Youth Chamber Orchestra, the youth orchestra comprising the leading young instrumentalists on the island and run by the Jersey Academy of Music in partnership with the Jersey Music Service, and culminated in a public concert on Saturday 22nd October at 7.30pm at the Jersey Opera House. Two large-scale works by Laura Rossi were performed. The first, Battle of the Somme, was commissioned by the Imperial War Museum in 2006, and is specially written to accompany live video screening of film footage from World War One. 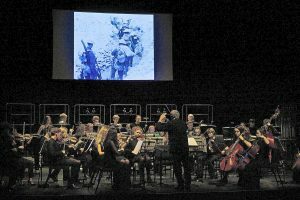 A giant screen filled the opera house stage, and the orchestra performed alongside the video screening, conducted by Stephen Threlfall, Director of Music at Chetham’s School of Music. The climax of the project as a whole is Laura Rossi’s Voices of Remembrance, performed in the second half, and this work intersperses atmospheric music for orchestra and choir alongside poetry reading. The organisers are thrilled that Vanessa Redgrave will be part of this concert to read the poetry, ten of the most well-known poems from the trenches of the First World War. 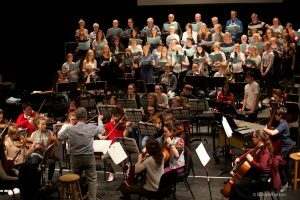 The combined choruses of Beaulieu Chamber Choir and the Victoria College Choral Society will join forces with the Jersey Youth Chamber Orchestra and Vanessa Redgrave to bring this work to life, a fitting end to the project as a whole.